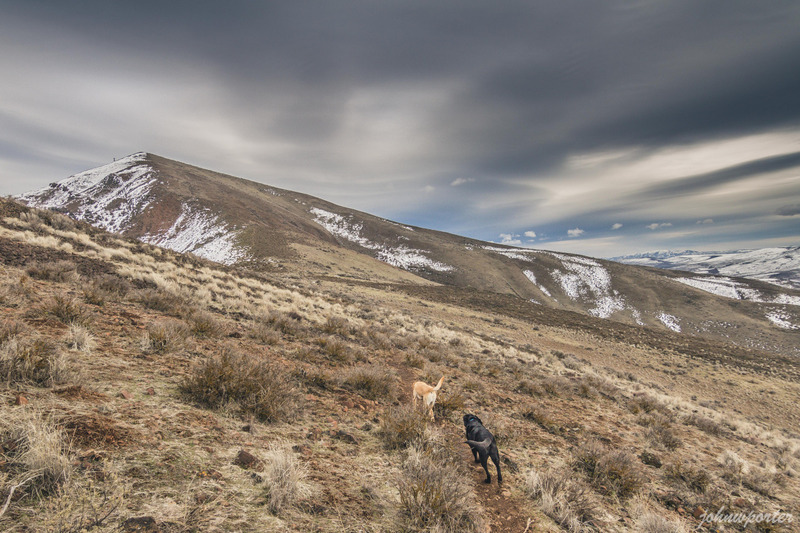 Weather was cloudy when the pups and I arrived at the trailhead, even though forecast called for mostly sunny. This was our third visit. We more or less followed the trail once we got up on the west ridge, and occasionally went off trail for photo ops. Snow patches on the ridge, and muddy and wet in some places but quite manageable. As always it got pretty windy at the top by the tower, so we drop down the east slopes a bit to avoid the wind coming in from the west. Rain started falling just as we were getting ready to head back down, but it only lasted about 30 minutes. The rain was light enough that we were able to take our time roaming around and taking photos as we worked our way down the hill back to the car.